Candy apples are a beautiful treat that’s fun to eat! 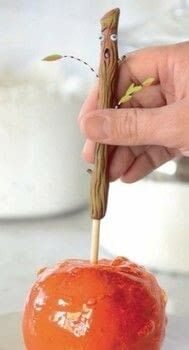 Although I can’t imagine not making the Spooky Forest Sticks for these, you could use this same recipe with average candy apple sticks. © 2019 Stephen Brown / Andrews McMeel Publishing · Reproduced with permission. Coat a baking sheet evenly with butter to keep the candy apples from sticking, and set aside. 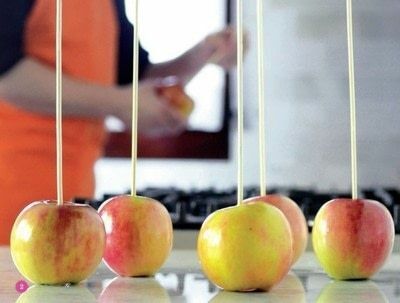 Insert a kitchen skewer securely into each apple and set aside. 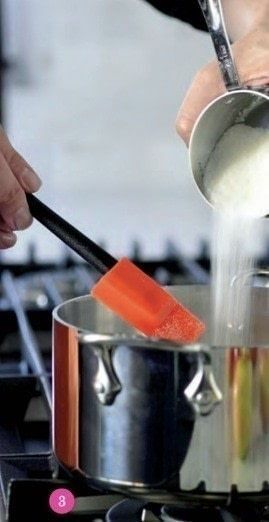 Place the sugar into the heavy-bottomed saucepan. 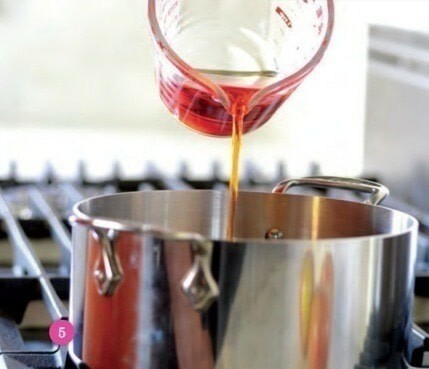 Add the orange food coloring to the ¾ cup water and pour into the sugar mixture. Bring the mixture to a boil over high heat, stirring constantly. 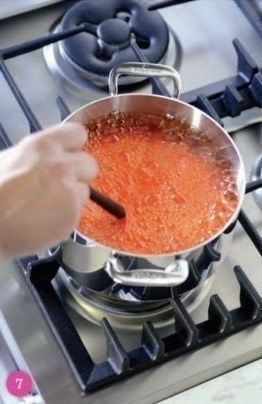 Reduce the heat to medium-high and place the candy thermometer into the pan. 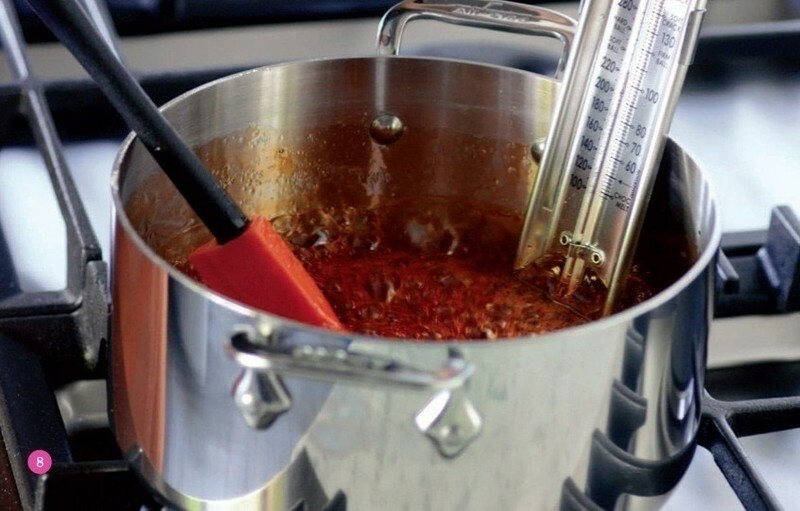 Continue stirring and checking the temperature often until the mixture reaches hard-crack stage (300° to 310°F). Don’t worry—it takes a while! When the temperature reaches 300° to 310°F, immediately remove the pan from the heat and set it on a heatproof work surface. 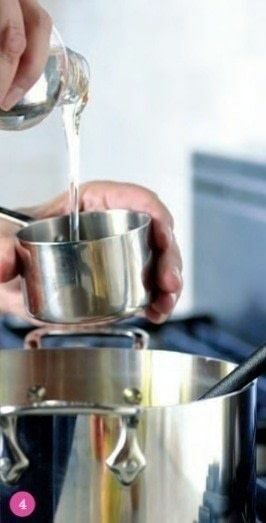 Dip the apples into the hot mixture one at a time, making sure to completely coat each apple. You must work quickly because the mixture will harden rapidly as it cools. 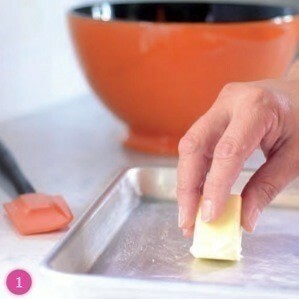 Carefully place the dipped apples on the buttered baking sheet and allow to harden. 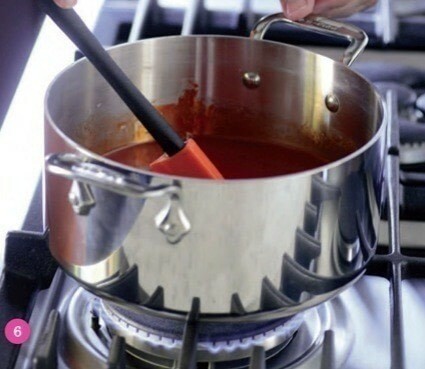 Quickly place all of your candy-coated utensils into a sink full of water for easy cleanup. Otherwise, the same hard candy on your apples will form on your thermometer. Carefully remove the kitchen skewers from the hardened apples and replace them with Spooky Forest Sticks. These look fantastic, do you know where I could by these amaizing sticks to go with my soon to be candy apples?